Vitebskiy Train Station . . . . Weather: Partly cloudy, occasional sun, cool and breezy. Cold in the evening and night. 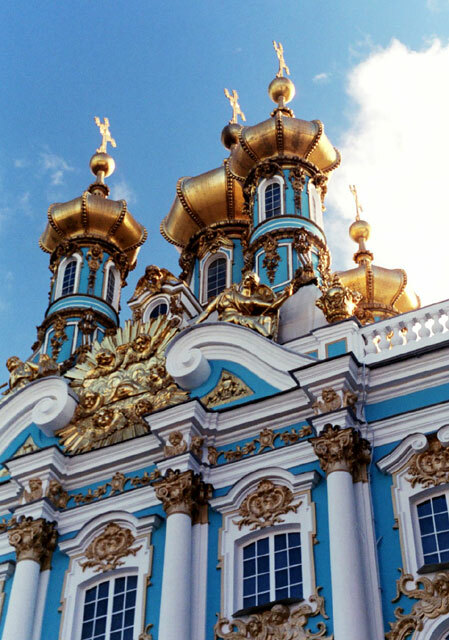 As the weather today is pretty good and it looks like we may have some sun, we decide to that we will head out of St. Petersburg to go and visit the Catherine Palace at Tsarskoe Selo. But first, we take advantage of the weather to snap a few pictures around the Winter Palace and down Nevskiy. We also change a few more dollars into roubles - the money is quickly spent in this city. Finally we take the time to get a light snack. Now, we have to figure out how to get to the palace. We have noticed a number of spots where tour buses stop and they seem to be selling tours to various attractions around St. Petersburg. There are plenty of lady touts standing around trying to sell tours, but we do not seem to have any luck getting their attention and focus. One lady quotes us an outrageous price for a tour. In the end, after many fruitless attempts, we come to the conclusion that they are trying to sell the tours to locals. So, we decide to take the train out to the village near the palace. So, to get to the train station, we figure the quickest way will be to take the metro. Boy, is it confusing for first time users who did not read Russian very well. The signs are poorly laid out and they do not make it clear how to transfer from one line to another. We end up taking changing lines and trains three times instead of the two that we should have done. A very nice lady in one of the stations help point us in the right direction. So, we finally emerge from the metro right next to the Vitebskiy train station. Now the difficult job of finding out how to buy the tickets and to find the right platform and train. There is no signage (either in Russian or English) providing any useful information. Only after running around the station and up and down several stairs do we find a small ticket booth in a far corner that sells tickets for the service that we want. They even have a sign in English setting out the schedule. We buy our two tickets and a friendly elderly gentlemen tells us which train to get on. This train is a local commuter train and it is very basic. But it does it's job. We had brought some food with us, so we prepared a picnic lunch on the long bench. Then sat back and enjoyed the ride. It slowly filled up with locals making their way out to the country. We had to pay attention to the stops as at each station they had only one small sign telling us the name of the station. After about 30 minutes we arrive at Tsarskoe Selo shortly after 2 PM. We get off the train and then head out to the streets to see if we can find transport to the palace. And we are in luck - for once the information from the guide book is spot on - the mini-bus taxi numbered 382 took us straight to the palace (the taxi even had a sign in English - now that is a smart owner). Once at the palace, we made our way to the main gate. There is a huge long line waiting to get in. We first grab a spot in the queue and then ask around about the queue. We are told that this is for tour groups only and that is the only way you can see the palace (we were told that it might be possible to get a special pass, but it would cost about $100 each - a large portion a bribe, we imagine). What a bunch of nonsense. Have they gone mad!?!? Well, we try to sneak in with a group, but the guards catch us and we have to leave. So, what to do? At the minimum we have to check out the grounds of the palace, so we wander around to the back and pay the $3 each required to get into the park. Then, we go and see if it will be possible to get into the palace from this side. In the end, we find out that they do allow individuals in here, but the tour is a shorter one and leaves out a few of the best rooms. Well, again, no choice, so we pay our $13 admission fee each and go and visit the palace (the grounds can wait). It is a very confusing mess, with separate ticket counters for locals and foreigners and coat and bag checks in the middle of the queuing area. There is a queue to get in and some how we ended up in the middle of a loud Chinese group. As we slowly approached the counter that checked the tickets, they were shoving and pushing us all over the place. They seemed very afraid of getting separated or something, but of course, the whole group was let through together. After putting white covers on our shoes, we began our self tour of the palace. This palace had virtually been destroyed by the Germans during the siege of Leningrad in the Second World War. It was totally gutted and there was only the shell of the building left, with no roof. They have done a remarkable job of restoring it, but of course, none of it is original and some of the restoration was guess work. After making our way up the Great Staircase with it's gaudy red curtains, we begin our exploration of the state rooms. 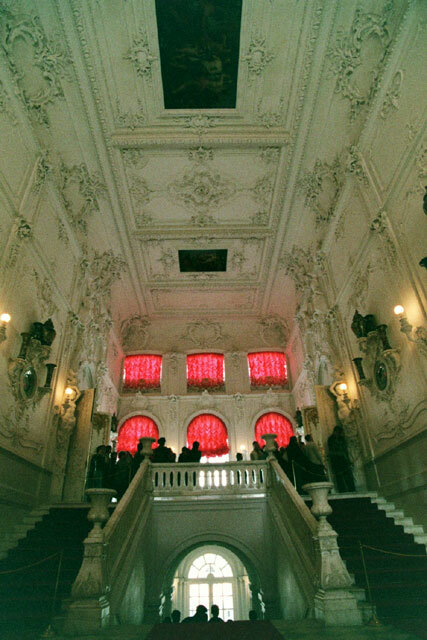 First is the Great Hall, a huge hall designed by Rastrelli with mirrors, gilded carvings and a vast ceiling painting. From there it is on to the Cavalier's Dining Room. This is another Rastrelli room, with white walls and gold trip. The table has been laid for Tsarina Elizabeth's gentlemen-in-waiting. 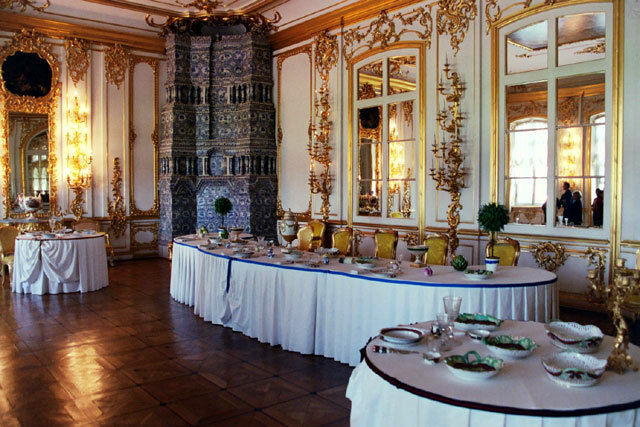 Next is the Gala Dining Room, done up as in the 1750's. The Amber Room has been stunningly restored using old photographs. 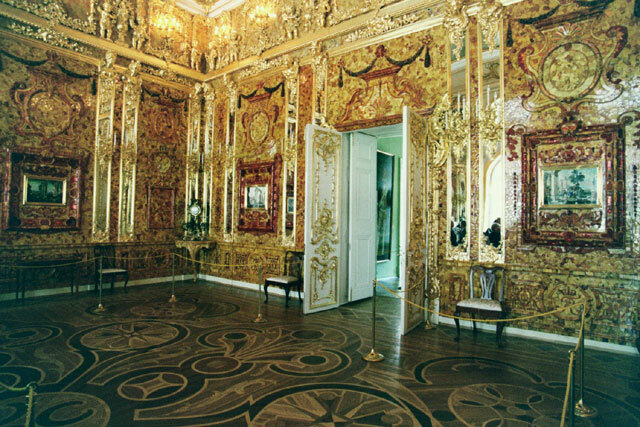 The original amber panels, from 1709, were by Andreas Schlüter and a gift from Friedrich Wilhelm I of Prussia to Peter the Great. It is an amazing room and we only wish we could get up closer to the panels to get a good look at them. 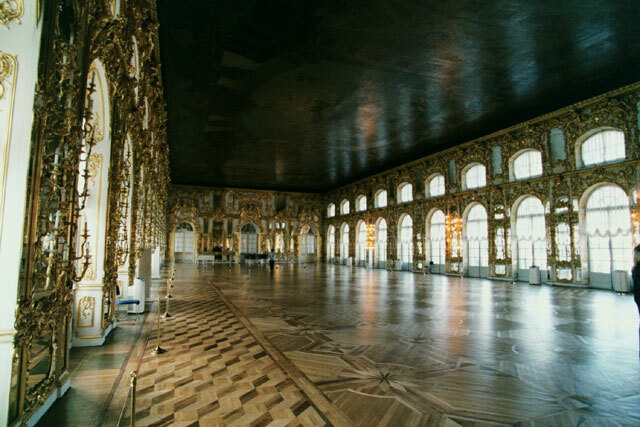 The next room is the Picture Gallery, followed by the Reception Room of Alexander I. The finally room that we get to see is the Green Dining Room. This is a gorgeous room and the restrained Neo-Classical style employed by Cameron stands in great contrast with the Baroque flamboyance of Rastrelli's designs. 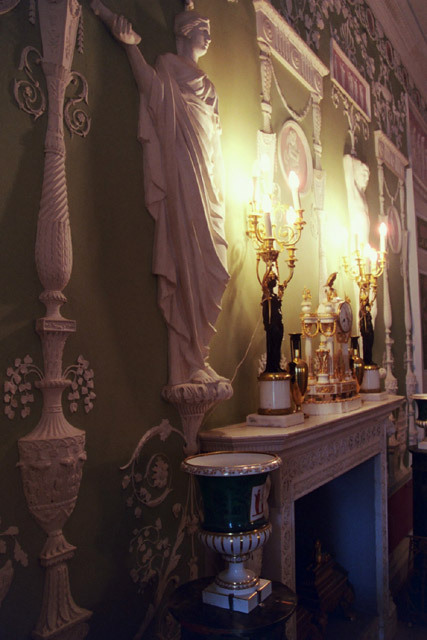 The stucco bas-reliefs are exquisite. Unfortunately our tour comes to and end here. We had been hoping to also see the Blue Drawing Room and the Royal Chapel, but you have to go on a group tour trough the front entrance to see these rooms. Guess they make more money that way. After spending some time (and money) in the gift shop, we head out to explore the gardens. They are huge and cover over 1,400 acres. We will only get the chance to explore a small chunk of it. 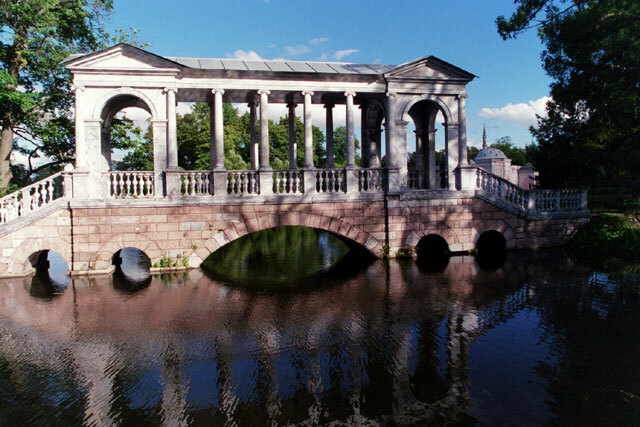 We pass through the formal gardens in front of the Catherine Palace and make our way down to the Great Pond. The Grotto is under renovation, so we do not have the opportunity to get a close up look. Once on the Great Pond, we decide to finish off our picnic lunch and sit down on the waters edge on the grass. The sun as come out and the sun's rays take the chill out of the air. Once we have finished eating, we carry on with our exploration. We wander around the pond, with a few detours here and there to check out some of the other features. 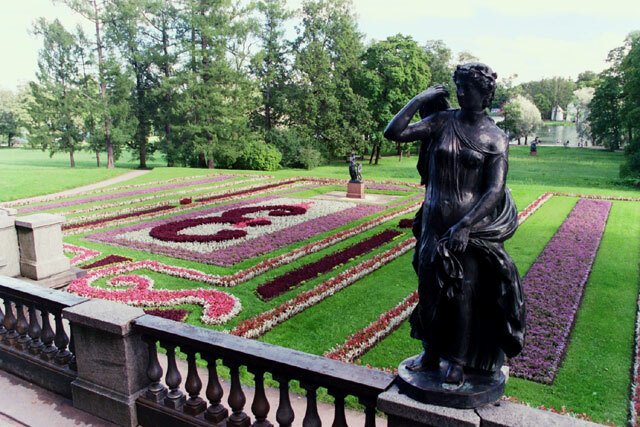 We see another formal garden and then the Girl with a Pitcher, a famous statue which inspired Pushkin to write his poem "Fountain at Tsarskoe Selo". Then it is on to the Marble Bridge, which is closed off. Coming around the far side of the pond, we pass the Turkish Bath, followed by the Admiralty with the 25 meter high Chesma Column. We finish off the gardens with a quick look at the run-down Hermitage, badly in need of restoration. Well, as it is not too much to look at, we then head back through the Formal Gardens to the Catherine Palace. The gardens will be closing soon, so we decide to head off and see if we can find the spot to catch out taxi-bus back to the train station. We arrive at the spot just in time to see the taxi head off, so as we have some time on our hands, we check out some of the many souvenir stands dot the sidewalks around here. After about a 15 minute wait, out taxi-bus shows up and we take the 10 minute ride back to the train station. We arrive at the station just in time to catch the commuter train back to St. Petersburg. 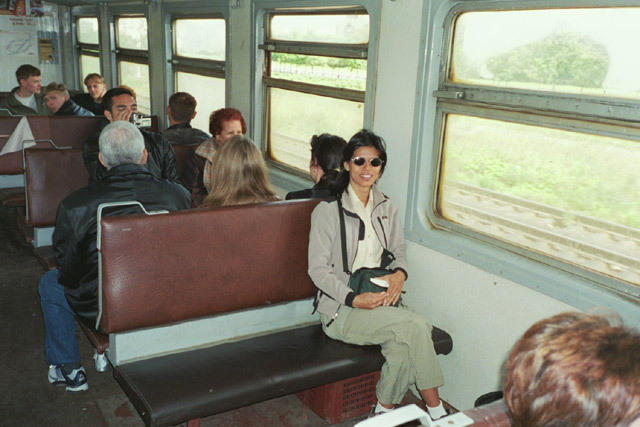 The train is packed, so we have to stand most of the way. It has turned out to be a very nice day, so it seems like plenty of people have taken advantage of it. We saw plenty of people with large buckets, baskets and other containers filled to the over-flowing with huge mushrooms. They looked very tasty. There was also a large group of unruly kids that were wreaking havoc in the compartment. The one adult with them seems to have lost total control - to the extent that some of the kids were even throwing things at her. All she did as smile and laugh, trying to be one of the gang. We were back in St. Petersburg just before 7 PM. We decided to walk back to our home stay, making our way up Gorokhovaya Ulitsa that stretched all the way from the train station to the Admiralty. We soon discover that this street and its surroundings seemed to be lined with restaurants and cafes for the locals. None listed in any of our guide books. We decide to stop in one to rest our weary feet and to get out of the chilly wind blowing down the street. Once we have rested our feet and warmed our innards with tea and coffee, we continue our walk. 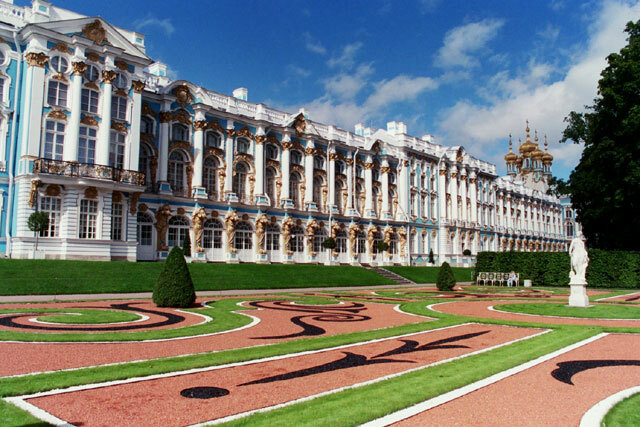 As the weather is so nice, we decide to head over to the Winter Palace to take some pictures of the square and it's surrounding buildings. Then onto the internet cafe to check our emails. As it is almost 10 PM, we decide that it is time to have dinner. We head off to the Joy Cafe, a restaurant near the Kazan Cathedral recommended by one of our guide books. And it turns out to be quite nice, even if it is a bit dark and dingy. The food is good with generous portions and at reasonable prices. The waitress was something else - but she did certainly typify the Russian service industry worker. She was very attractive, cut, well spoken and nice, but amazingly curt. It is hard to figure out how a waitress can be so efficient and helpful, but yet so unfriendly and cold. An amazing combination. We were also entertained by the group at the table next to us - looked like a mafia boss with his mistress and one of his lackeys. They drank and smoked lots and the table was overloaded with food, which they would never be able to finish. After dinner, at around 11 PM, we take advantage of the good weather to walk around the streets of St. Petersburg and take some night shots of the buildings. While the streets are dark and at times a bit scary when off the main roads, we never felt at risk. In fact, we saw many single Russian woman walking the streets. 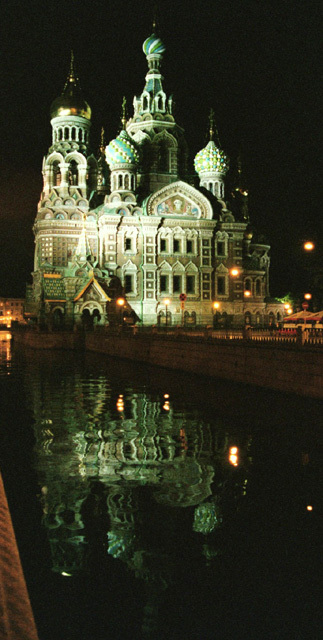 We walk up along the Griboedova Canal to the Church on Spilled Blood. The halogen lights gave the church, along with it's reflection in the canal, a very strange, greenish glow. After taking a few photos, we move on. 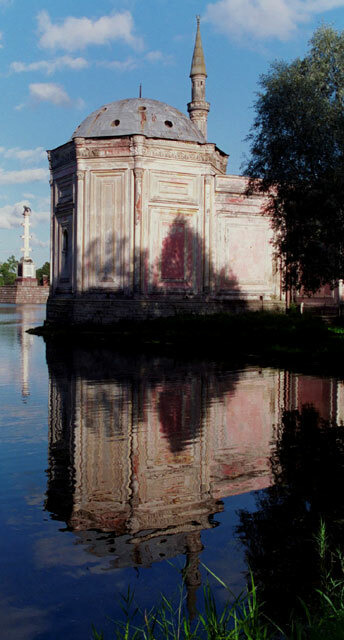 We walk by the Imperial Stables, across the Moyka Canal to the Palace Square. The Winter Palace, Hermitage and General Staff Building are brightly lit up and the effect is fantastic. It gives a completely different look to the historic place. We snap away and take a number of pictures. Around midnight we make our way back to our home stay and quickly crash after our long day.